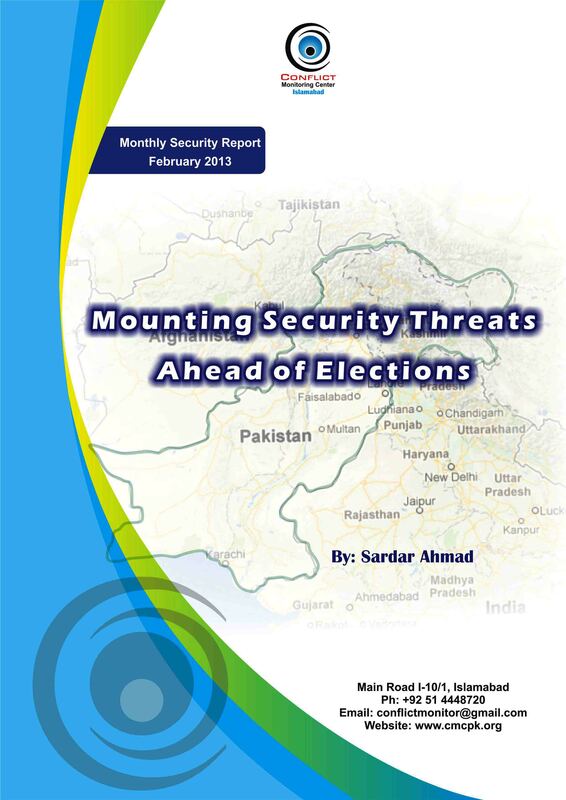 The security threats are looming large ahead of election campaign in the country. The insurgents and sectarian organizations have intensified their activities to pressurize the political parties and government to accept their demands for the sake of holding peaceful elections in the country. The political and religious parties are divided on regional and sectarian lines on the issue of peace talks with TTP. The sectarian divide has been sharpened after increased attacks on Shiah population in various parts of the country. More incidents of violence are expected during the election campaign. The militancy and counter-insurgency campaign claimed lives of about four hundred people and left more than five hundreds others wounded during the month of February 2013. Out of total 401 killed, 280 became victims of militants’ activities while 121 others lost their lives in counter-insurgencies actions by Pakistani security forces. The victims of militants’ activities were mostly civilians as 173 out of 280 total killed in their hands were non-combatant ordinary people. The militants used IEDs as most lethal weapon which claimed at least 121 lives and left more than 316 others wounded in 31 incidents. Except five, all victims of IEDs were civilians. The highest killings in IEDs were reported in Baluchistan, i.e. 86, besides 200 left injured. All those killed or injured were civilians. IEDs also took lives of 24 civilians in FATA. The largest victims of suicide attacks were also the civilians. At least 45 out of total 90 killed in seven suicide attacks were ordinary people. The number of suicide attacks in February 2013 increased by three times as compared to January 2013. Most of the militants’ activities were reported in KPK where 107 people were killed followed by 90 in Baluchistan, 73 in FATA and 10 in Sind. FATA remained the worst hit area by violence where 189 people were killed, followed by 109 in KPK and 90 in Baluchistan. In FATA, most of those killed were suspected militants, i.e. 147 out of 189. The security forces actions were also concentrated mostly in FATA where they killed 111 militants. The data compiled by the CMC shows that at least 13 districts of Khyber PK, 8 districts of Baluchistan, and 6 agencies of FTA were affected by violence. The violent-hit districts in Khyber PK included: Bannu, Carsadda, D. I. Khan, Hangu, Kohat, Laki Marwat, Lower Dir, Mardan, Tank, Nowshehra, Peshawer, Swabi, and Swat. In Baluchistan, these districts were affected by violence: Barkhan, Dalbandein, Dera Bugti, Nasirabad, Pasni, Qallat, Quetta and Turbat. These agencies of FATA were hit by militancy: Orakzai, Khyber, Kurram, Mohmand, North Waziristan and South Waziristan. Three provincial capitals, i.e. Karachi, Quetta and Peshawar and latter’s adjoining Khyber Agency of FATA have been the main targets of the militants during the month. All these areas also have significance for NATO forces due to their location on its supply routes. However, the escalation of militants’ activities in these districts shows the influence and strength of insurgents who are now openly challenging the writ of the government in its provincial heartlands. 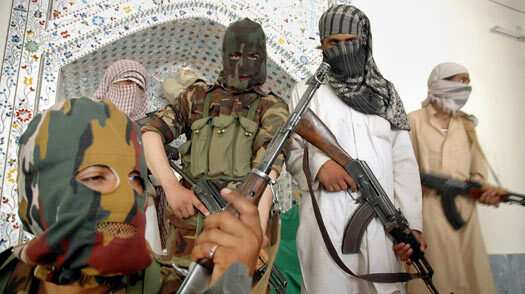 The militants have stepped up their activities ahead of announcement of election schedule in the country in a bid to pressurize the government and political parties to review their policy towards war on terror. A dramatic increase in causalities in militants’ activities has been observed during the last two months. A steady decline in militants’ activities and ensuing casualties was observed since April 2012 but now there has been a sudden increase in the number of casualties from January 2013. Contrary to the widely held apprehensions that either the government or the establishment was behind the present wave of violence for various reasons, the CMC report claims that the militants were the main responsible were these acts. It noted that militants were determined to unleash terror in order to force a peace deal on the government and political parties which are anxious to hold elections in a peaceful environment. The main political parties are divided on the issue of talks with TTP. There were two APCs organized by two different political parties on the issue of holding peace talks with TTP. Some parties participated halfheartedly while some others did not bother to attend them. The sincerity of some parties to peace talks is also doubtful. The most of the Shia and Bralevi organizations are bitterly opposed to the idea of any talks with TTP. The widening political and sectarian divide can have far-reaching security implications for the country.